There was mild drama recently when the leader of the Indigenous People of Biafra, Nnamdi Kanu recently appeared before Justice Binta Nyako of the federal high court, Abuja for the resumed hearing of the treasonable felony charge brought against him and 3 other co-accused Biafra agitators precisely on the 10th February, 2017. The case on that date was slated for the official start of the ‘’secret trial’’ that President of the contraption called Nigeria had ‘’decreed’’ to be adopted for the trial of the accused which the court had equally approved. The cause of the drama was the attempt by the Prison officials that had brought the accused to the court insistence that they have to enter the court through a ‘’special secret door entrance’’ in lieu of the normal general entrance that had been used until that day. The Prison officials had claimed that it was an ‘’order’’ from above and thus must be adhered to. The IPOB leader however maintained that he will use only the normal route and not the proposed secret entrance. It took the intervention of the Head of Prisons to calm the situation as the security officials detailed to the case were only in interested in harassing and intimidating the accused and the Biafrans that have come to the court to show solidarity with the accused. It will be recalled that the Nigerian Gestapo organization known as the DSS were the first to force the IPOB leader to enter the court through the back door when Justice John Tsoho was still in charge of the case. It was therefore disheartening to see the Prison authorities that were expected to be professional in their duties adopting the Gestapo style of the DSS. 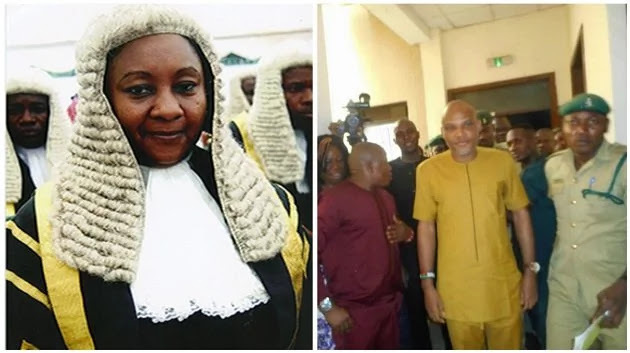 It is however on record that for the first time, that Justice Binta Nyako spoke against such maltreatment of Biafrans in the court premises especially the accused thus wondering why this case was being treated differently from other court cases that she has handled in her court and other courts in the country. She wondered where the ‘’order for show of power within the court premises’’ in this case was coming from. It is believed that she must have watched the charade that took place in the court premises on that date via the CCTV connected to her chamber. Pretending to be bittered by what she saw as it concerns manhandling of Biafrans attending the court case including Biafran Journalists and reporters, Justice Binta Nyako added that fundamental human rights of the defendants and Biafrans present in court must not be infringed upon as it's their constitutional rights that must be expressed by them willingly in accordance with constitution. She ordered that further threats and intimidations must stop. Justice Binta gave the warning to Shuaibu Labaran, who is the prosecutor for the case to deliver to the Gestapo outfit, the DSS. She added that each defendant is entitled to four (4) court attendees to enter the court room and witness the proceedings on each trial dates. In a Banana Republic like Nigeria where court orders/judgement are hardly obeyed by the government in power especially as very frequently done by the present government of Adolf Hitler Protégé, Muhammadu Buhari it remains to be seen if this order by Justice Binta will be obeyed. But like orders in the past that weren’t obeyed, it’s most likely that this one will go the way of ‘’court disobedience’’ by the Buhari administration since "order from above" supersedes every court order.